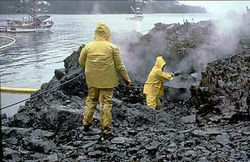 1 Caption: Workers using high-pressure, hot-water washing to clean an oiled shoreline after the Exxon Valdez oil spill in 1989. 2 Part of "America the Beautiful" is about a "shining sea." What do you think of when you hear those words? A clean, fresh ocean? It is too bad that the ocean is not that clean. Ocean pollution is a big problem. 3 The ocean covers around 70% of the Earth's surface. The ocean has different layers in it like a big blue layer cake. These layers are called zones. The top zone has a happy name. It is the sunshine zone. It goes down about 600 feet. 1. Draw a picture of the sunshine zone of the ocean. Include at least two fish and two other kinds of animals in your picture. 2. Does your family recycle anything? If yes, explain how you do it. If not, write a plan so that your family can start to recycle most of your trash.